On August 13, 2013, Sean Boushie signed a sworn affidavit before a notary, and he swore that Bill Windsor resided in Missoula County Montana. The false sworn affidavit was used to get William M. Windsor arrested and jailed for 134 days. CRIMINAL CHARGE AGAINST SEAN BOUSHIE: On August 13, 2013, Sean Boushie signed a sworn affidavit before a notary public as part of his Petition for Temporary Order of Protection. In the sworn affidavit, he stated that William M. Windsor resided in Missoula County Montana. This is false as Sean Boushie admitted in a letter that he attached to his sworn petition. On Page 6 of Sean B**shie's Petition for Temporary Order of Protection dated August 13, 2013, Sean B**shie states that William M. Windsor is a legal resident of Marietta Georgia or Box Elder South Dakota. Yet on Page 1 of the Petition, he falsely claims William M. Windsor lives in Missoula, Montana. He claimed Bill Windsor lived in Missoula so Ravalli County resident Sean B**shie could qualify for a Missoula County Montana protective order. 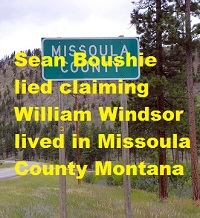 Proof of William M. Windsor's residence was on file in the Missoula Municipal Court where Sean B**shie filed his perjured affidavit as Bill Windsor had previously attempted to obtain a temporary order of protection against Sean B**shie. This Missoula Municipal Court Petition shows his address in South Dakota as does the Petition that he filed in Ravalli County. 1. Read Sean B**shie's Petition for Temporary Order of Protection.